For this BEST swap I created 2 books made completely of recycled material: board, paper, and thread. 1) HollyWood is the first of the set. It is a hard cover coptic stitched journal made from 200 pgs of text paper from a discarded college library book entitled "Lesbians in Hollywood Film". 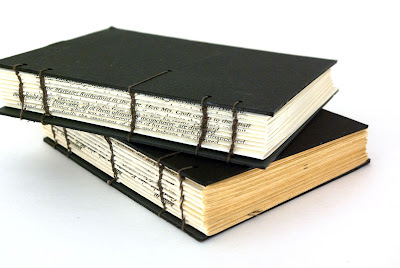 The covers of the discarded book were used in the making of a different coil bound notebook and the pages were left. I figured, what better way to use them! The book measures 4 1/2 x 5 1/4. The book board is left-over matte board from a photography project that serves well as blank black covers for the book. The thread that was used to coptic stitch the book is also left over from a previous project. 2) German (!) is the second of the set of recycled coptic stitched journals I made for this swap. It too has 200 pages only this time from a vintage German college textbook with all the notes and scribbles intact from the previous owner! Like HollyWood, the original covers of the German text were used in another project therefore left-over matte board from a photography project was also used to cover this book. German (!) measures 4 x 5 1/4 and also has left-over book binding thread binding the coptic stitched book together. 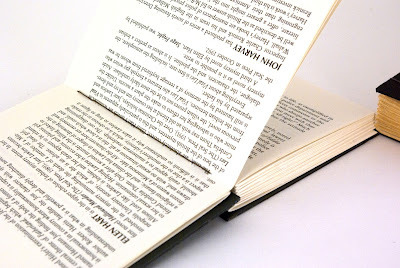 Ooo, cool book, I love how the text pages show through the binding...wow!